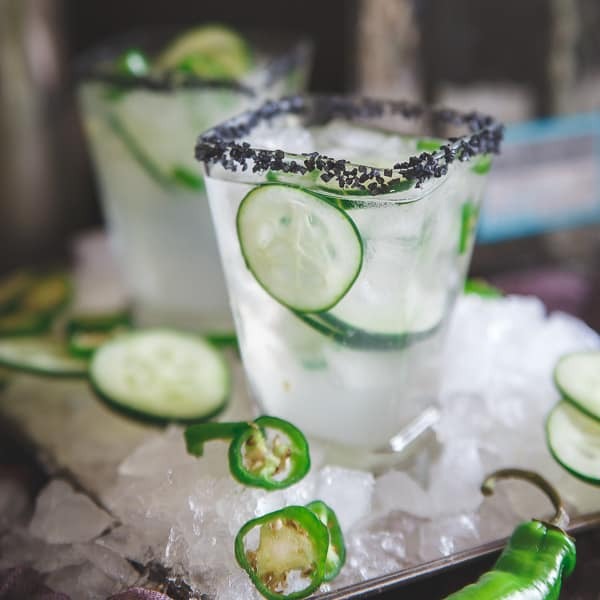 Inspired by a recent trip to Mexico, this serrano cucumber margarita is both spicy and refreshing at the same time making for one delicious happy hour! When we were in Cabo a few weeks ago, Ulysses and I ended up sitting at the bar with one other lady from Alaska (talk about escaping winter!) for the “introduction to Mexican cocktails” class. By the attendance of 3, I immediately assumed the class (put on every week for us very American tourists) would be a bust. Turns out it was one of my favorite things we did all week. An hour and 5 drinks later, the thing that stood out (in my somewhat fuzzy brain by that point) was the serrano cucumber margarita. It was bright, spicy, refreshing and salty all at once and would become my happy hour order of choice for the remaining 3 days we had at the resort. I’ve had many margaritas over the years, some are barely stomach-able (thanks to a 21st birthday party that involved a few too many cheap ones) but some, when done right, are really the most delicious way to combine savory elements in drink form. I’m passionate about food, good food, real, whole foods, we know this by this point, right? When you can combine that with good quality alcohol like a 100% blue agave tequila produced in small batch 100% copper stills like Altos Tequila Plata, you’re set up for one epic happy hour. 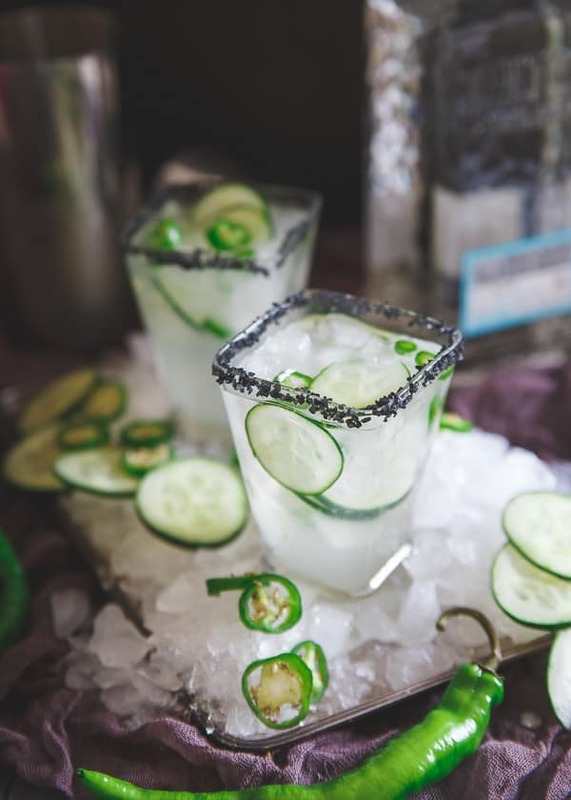 Fresh hot peppers, crispy cucumbers, quality tequila and some black Hawaiian lava salt is a combination that will keep your mouth busy with intrigue as it processes spice, bright cucumber freshness, charcoal undertones, a hint of sweet agave and tart lime. When you have quality ingredients like this, the last thing you want is a sub-par tequila that ruins it all. Thankfully, getting that without having to forfeit your paycheck to do so was founders Henry Besant and Dre Masso’s number one goal when partnering with Maestro Tequilero Jesús Hernandez at the start of Altos Tequila, a tequila created by bartenders for bartenders. I may not be sitting poolside in a bikini paying for someone else to prepare it for me any more but thankfully I can reproduce something just as great at home. Swap out the pool for the fireplace right now and it’s almost identical. Combine the tequila and serrano pepper slices in a jar and cover tightly with a lid. Let sit for at least 24 hours at room temperature. Strain to remove the pepper slices and seeds and reserve the tequila. Add pepper, cucumber, lime juice and agave to a cocktail shaker and muddle. Add the tequilas, triple sec and ice cubes and shake until chilled and well combined. Find out where you can buy Altos Tequila near you here. If I’m doing margaritas they have to be good and made with quality tequila otherwise the next morning is brutal. I love the spicy serrano flavor in this one paired with the refreshing cucumber! Can’t wait to sip on one of these out on our deck! I was just in Mexico too, and I missed the tequila tasting. My husband on the other hand came back raving about it (and with the fuzzy head you mentioned.) I love this sweet, hot and salty combo. Makes my mouth water! These look so awesome! I can not wait to try these. Gotta love a little spice to your cocktail! What a great flavor combination!